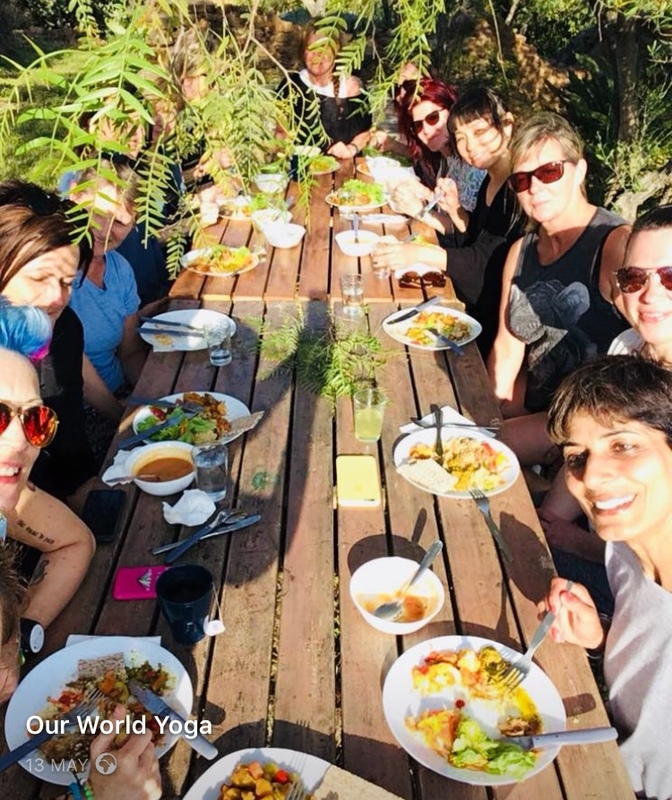 We have teamed up with Our World Yoga to offer retreats in Portugal this is our fifth year at this venue and its a pleasure to return and introduce new people to this lovely part of the world. After searching venues throughout Europe a few years ago, we could not have been happier to have fallen upon this beautiful, idyllic mountain hideaway, this will be our 5th retreat here. It is the perfect location within the Algarve. Unspoilt and peaceful and September is the perfect time to visit. During your stay, we offer every day, walks/jogging through the mountains at Sunrise, morning mobility & movement classes, before breakfast, a variety of yoga classes throughout the day, from Yin Yoga, Flow/Vinyasa more Dynamic, Aerial Yoga, Workshops, (this year we offered an Aerial Inversion Playshop, a balancing workshop, working your way from your feet to your hands, last year mastering head stands and for the more adventurous, finding the tools for a controlled hand stand), Restorative Yoga, Pranayama. Meditation and Yoga Nidra. There are plenty of hammocks dotted about the valley and main house, as well as each cabin having its own, for you to sunbathe or relax in the shade and catch up on a good book. Included in your stay we offer 3 healthy freshly cooked Vegan/Vegetarian meals with tea’s and water. We have our own chef, who will look after you and ensure all your dietary requirements are met. You will not go hungry, her food is delicious, her knowledge is exceptional, and her cookbook will now, fingers crossed, be finalised. She pours love into her food and you can taste it. Most of the yogis from previous years are not Vegan, but have really enjoyed the week, trying new and interesting recipes. This year we are offering an optional ‘Vegan Cookery Workshop’ with our Portuguese Chef, this will be for 2 hours and prior to lunch, so we can sit down and enjoy what we’ve made. Every year on retreat, we are asked, how does she do it, the variety, the taste. The chefs answer is knowing where the food is grown, starting with when it was planted, how it is picked, how it is treated in delivery and through the love it is given, in the kitchen….all will now be revealed! The focus on the retreat is for you to come back feeling healthy, happy and rejuvenated, therefore no alcohol is permitted. This years dates September 6th – 10th & 2nd -6th September , Come & join Gillian Watt and Val Johnston, both highly qualified and dedicated teachers, with a special Guest Teacher for 1 workshop, Europe’s Lead GMB Trainer! Please Note: The 6th – 10th September, Yoga Retreat is now full, however we do have a waiting list as occasionally space becomes available. You will feel amazing after this retreat, it’s our mission. Our sunny mountain retreat in the Algarve. Purposely built for artists in the 60’s, this very special place, was built in this particular spot as they believed their to be a peaceful healing energy. Drawn to the peacefulness of the people and the space, the yogis arrived in the 70’s and have been coming ever since. You cant help but fall in love with the rustic, silence and beauty of the place. Deposit only £100, (this secures your place and is non-refundable). PLEASE EMAIL TO LET US KNOW YOU’RE INTERESTED AND WE’LL WORK OUT DEPOSIT TRANSFER AND ALLOCATE YOU WITH A ROOM OR CABIN. Once we sell out, we start a waiting list and as soon as a space becomes available, we’ll let you know. We only have 24 Spaces this year on each retreat. There really is something for everyone and all classes are thoughtfully considered for all levels. Depending on how you are feeling each day, there will be options for you to practice therapeutically or dynamically. 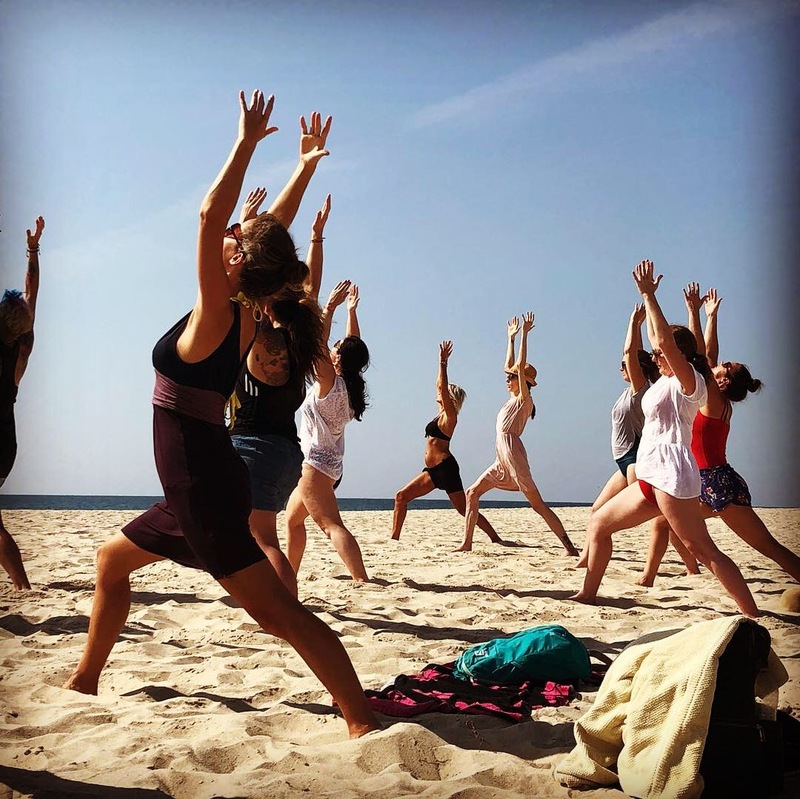 Included as part of the price of the retreat, we take everyone to the beach for a ‘beach yoga excursion’. This includes, yoga barefoot on the beach, here we also practice pranayama and meditation, there is nothing more beautiful than meditating to the sound of the ocean. A delicious vegan lunch with energy balls is packed lovingly for us, to picnic and enjoy in the sand dunes. Every year we offer an optional Paddle Boarding excursion, for all levels, including the complete beginner. 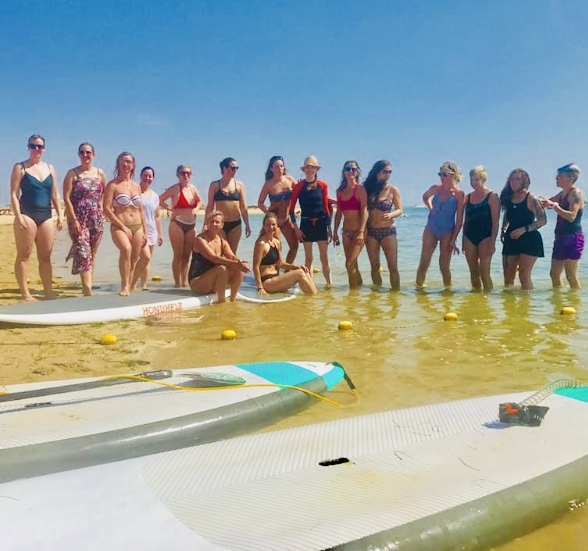 This will include Paddle Boarding to a close by Island, the opportunity to try some SupYoga (not as easy as it looks, expect a lot of laughs and photo opportunities) and Paddle Boarding back to the beach. This is an additional cost, which we pay locally, however usually we pay 15/20 euros each, plus taxi fares, which we split. It’s very inexpensive and the company are fabulous that take us. If you’re lucky, they may even bring the paddle boarding pup!! We also organise for groups to visit the beautiful town of Tavira, gorgeous little shops and plenty of sightseeing. The accommodation is basic, but with everything we need. Included is the use of the small pool, towels are provided. While there are some yoga mats, we recommend you bring your own. Jet2 in previous years have allowed us to bring our Yoga mats into the cabin as hand luggage. Most people do fold them though and pop them in the hold. We fly into FARO. On the premises is a treatment/massage room with a range of holistic therapies. A full body massage with Estrella (she is amazing), is 45 euros and paid locally. We will take bookings once we arrive. We will place you in the house on a first come first serve basis, unless you specifically ask for a cabin. Once the main house is full, we will allocate you a cabin. Our World Yoga and Aerial Yoga Edinburgh have joined together to offer you these 4 night ‘Yoga Experiences’, we will really enjoy sharing with you the energy of this amazing place and the beautifully kind people of M Mariposa. Transport to & from Airport, (as long as we are arriving on the morning flight and leaving on the morning flight together), is included in your retreat price. If you choose to fly in and leave at a different time, then the travel costs incurred must be taken on, by yourself. Beach Excursion is all included in your price.